Although it’s January, the Spring-like weather as of late may put you in the mood for a picnic. But since that’s unreasonable, you can settle for a picnic-like purse. Anna Corinna’s Crosshatch Satchel handbag for Spring 2007 reminds one of a mod tablecloth. 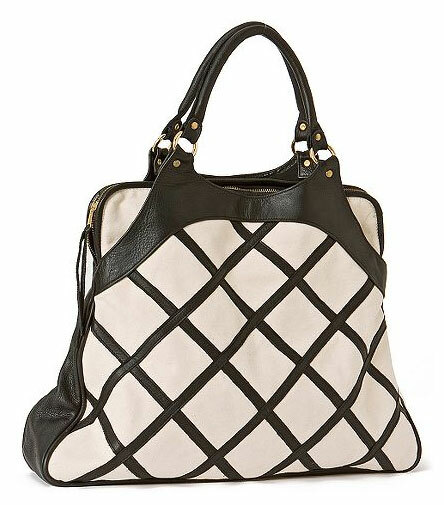 The graphic, crisscrossed black leather trim is laid over fresh white canvas, with large black shoulder straps. The trapezoid shape is distinctive, and the large, flat shape is ideal for toting a tablecloth, treats, and other tidbits. Pack it up for your own picnic. Buy it now at Anthropologie ($398).